(MAY 10, 2005 - Cranford, NJ - EXCLUSIVE) You can buy yourself a new Hydrogen Super Highway here, all it takes is "$15,000,000 per mile, and $250,000 per Rail Car. 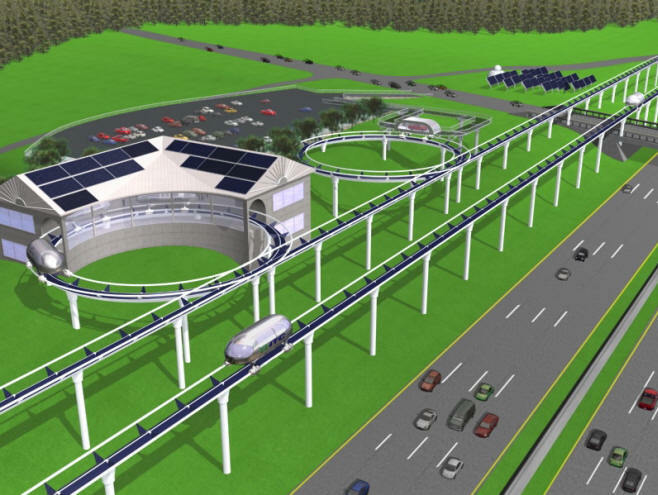 Sound's expensive: it's NOT, as at a $0 cost for fuel per mile, powered solely by Solar/Hydrogen and Heat/EnergyStorage Power, the Hydrogen Super Highway represents the first in a generation of extremely high speed MAGLEV systems MENTORED BY the American Computer Science Association Inc. The project was founded and organized by a brilliant Michigan entrepreneur and scientist, Justin Eric Sutton, the Interstate Traveler Project is an ingenious solution to the need for systems of transportation powered by abundant sources of easily obtained, environmentally friendly energy that reduce our dependency upon fossil or fissile fuels such as coal, oil or nuclear energy. The Association has studied Mr. Sutton's proposed solutions and has found they not only have merit for interstate transportation of passengers, freight and vehicles: his value proposition also has merit as a generally convenient means to produce and store an abundance of solar energy. This is accomplished by efficiently converting it to Hydrogen, using advanced methods to electrolyze ordinary water into it's component parts. While on a far more sophisticated level, what Mr. Sutton is selling deploys a method for using solar energy electricity to produce storable clean burning hydrogen, something accomplished in a manner not all that different from a common high school chemistry lab demonstration. He intends to do so along high technology MAGLEV tracks laid along 54,000 miles or so (eventually) of already clear interstate highway and umpteen thousands of miles of existing railway egress (he is seeking to license said acreage to his company, providing a valuable source of income to the interstate highways and railroads, along with excess power for their use at no extra cost). 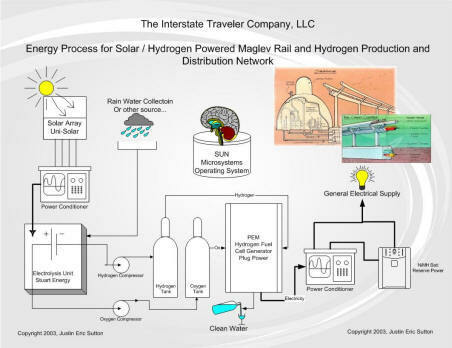 Mr. Sutton's scientific method, depicted in a figure later in this article, involves electrolyzing water, producing environmentally safe hydrogen and oxygen, powered by the solar energy panels lain along the entire length of the Interstate Traveler's tracks, which is then converted to motive force, and/or sold to the outside world in the form of low cost compressed Hydrogen. This highly innovative approach is similar to the classroom demonstration where the professor places two electrodes in water connected to an electrical power source, collects the hydrogen that emits from the electrons infiltrating the water, catches it in a Beaker, and then burns it off in a small, rather loud explosion designed to wake the kids up sleeping in the back of the class. Only, in the present case, not only is Mr. Sutton intent upon using that hydrogen to power railroads based on MAGNETIC LEVITATION (MAGLEV) technology, in his case the kids sleeping in the back of the class are our political leaders and energy policy makers. They should immediately heed this wakeup call from Mr. Sutton: who has solved an enormous number of problem: simultaneously providing what appears to be an abundant source for clean, safe hydrogen, and an essentially environmentally safe and sound method of providing clean, low cost transportation that could eventually replace most other forms of long distance travel. Imagine riding along the scenic vista from New York City, Long Island and Westchester County, leading down the Jersey Shore to Atlantic City, where vacation goers can arrive at the world famed Boardwalk, with it's entertainment and Casinos, in approximately 22-35 minutes door to door or less! That's probably less time than it takes for most people to drive from work to home today. Pack your bags, Mildred, it's Trump's famous Casino, next stop! MAGLEV vehicles of the kind proposed by Mr. Sutton, would travel at nearly 250 miles per hour on cushions of vibration free, magnetically induced air, for a flight a few centimeters off the MAGLEV track. Normally a trip of between 2 and 3 hours by car (plus the commensurate tolls, fuel stops and bathroom/food breaks): travel between Penn Station and the famed Atlantic City Island 116 miles away, at 250 miles per hour, would take considerably less... in fact about 1/5th the time. Travel to and from the resort would have none of the hassles normally associated with a short hop jet flight. It would be accomplished without wasting all that petroleum, fuel that could be better used to explore the Atlantic City seashore community, visit Casinos and take in the night sites. And, another 15-20 minute hop on the Interstate Traveler a day or two later, and one could travel from AC to Philadelphia to see the birthplace of our Country, Independence Hall! And, we ask: why even leave your car behind? The design parameters of the Interstate Traveler System not only call for passenger ready MAGLEV vehicles, they also call for "auto carriers". Such carriers could take the family's Ford 500 for an ultra-fast trip at 250 mph to any location on the system, offloading them to allow the family to motor around the area. A short two week vacation could visit a wide variety of areas covering nearly 2/3 of the Nation, stopping for a day or two to explore each area, then hopping on the Interstate Traveler System and moving on to the next. In the future, such automotive vehicles could also be converted to hydrogen, and tank up as they exited the Interstate Traveler, with enough fuel to do local travel and return to the trip back to New York or Long Island in another, super quick 30 minute run, or on to Chicago, Phoenix or Dallas. Trips between Boston and Washington DC, would be even more fascinating, going the full 428 mile trip in only 1 hour and 35 minutes from an on-load not far from Boston's Callahan Tunnel to offload right onto the DC Beltway just outside Washington proper! We'd imagine even the coal-rich Kennedy family would not be adverse to limo'ing back and forth between Martha's Vineyard and the halls of Congress this way, if an extension were built just off the island's Ferry port on Massachusetts' Cape Cod! The amazing economic value proposition behind this remarkable transportation system is that it's fuel costs would be negligible. After building a multi-state length of track, say, from Boston to New York to Philadelphia to Baltimore to Washington, DC, the entire system would be powered by electricity and/or internal combustion engines powered by clean-burning Hydrogen. Burning Hydrogen produces heat and water. 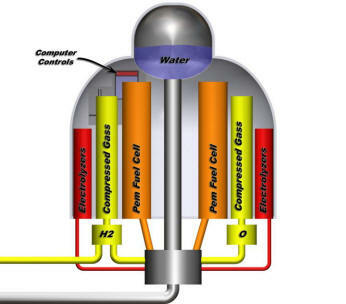 Converting it to Electricity using a Hydrogen Fuel Cell, produces an abundance of electrons (electricity) and an amount of clean water and smaller amount of heat. 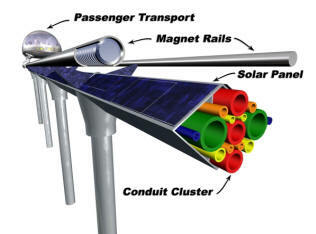 A "solar paneled" Conduit Cluster running the length of the entire the tracks (which would be built in pairs, one in each direction, to allow MAGLEV vehicles to be used for return trips), would produce approximately (by our estimates) as much as 400,000 watts of solar powered electricity continuously for every 5000 feet of track in one direction. Pictured below is an overview that shows the Interstate Traveler's control system visualized under the constant automation by a Sun Microsystems minicomputer. The basic process that produces electricity by Sunlight striking EPV (electro photo voltaic panels) Panels, is then used to convert distilled water into hydrogen and oxygen. While the oxygen could be bottled and sold, cheaply, the hydrogen would serve as a "battery", stored in compressed form in cooling tanks adjacent to the Traveler System in Utility Centers. As a power source, it would later be burned to power internal combustion engines for motive force or to generate elecricity, and/or more directly converted to electricity using Hydrogen Fuel Cell technology. A quantity of this power would drive the Interstate Traveler System of MAGLEV vehicles, and to provide for other power needs such as utility stations, access stations, lighting and maintenance. A very significant balance, however, could then be sold to the domestic power grid of the United States, to power business, industry and homes. With an eventual system size of nearly 54,000 miles, would yield as much as 45 Billion Watts of continuous electrical power from hydrogen, a substantial amount of which would be provided to the US Power Grid, about 80% of it or more at first. The Association calculates that by running a second, third or fourth pair of conduits adjacent to each track, an additional 90 Billion Watts of continuous electrical power can be sold directly to the US Power Grid, for a total of 120 Billion Watts produced for use at a nominal cost of upkeep of the system. The system would be very inexpensive to travel over, since the fuel costs would be nominated by the ready source of energy. A certain amount of hydrogen would be stored each day to encompass night time travel and weather related burdens. The above and other pictures may be examined, along with an abundance of study data, business plans, federal and state records data, long range plans, and accolades form literally every energy organization who has encountered Mr. Sutton's proposal (along with references, an excellent detailed business plan and incredibly detailed plan for implementation) may be found at the Interstate Traveler Project website: http://www.interstatetraveler.us/. The possibilities of Mr. Sutton's project are boundless when one also factors in special use lines which can transport container freight from seaports inland, powered only by the Sun and the novel Hydrogen producing energy storage facilities of this highly adaptive project plan. Maglev technology allows heavy objects, like MAGLEV rail cars, to become momentum storing vehicles of extraordinary efficiency, flying slightly above the tracks at up to 300 MPH or more. Combining solar energy panels on the tracks (see picture to right) with full time energy converters (see picture below) that convert the resulting electricity into hydrogen obtained from water, The Interstate Traveler pays for itself, even the cost of construction and operations is recouped within the first three years of interstate traveler usage! In this Maglev system, which is similar to the one in Japan, the vehicle has superconductor loops (approximately 600 kiloamp turns). The guideway has aluminum loops at normal temperature; their loop currents are generated by magnetic induction as vehicle loops move past them. 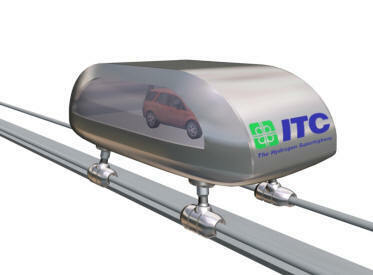 The induced currents in “figure-8” guideway loops levitate and vertically stabilize the vehicle. The left and right dipole guideway loops are electrically connected to form a circuit. Net flux and current in the circuit is zero when the vehicle is centered in the guideway. If the vehicle moves left from the center, the magnet force develops to push it back to the center. How Does the typical Japanese Maglev Work? Maglev has been a dream since the early 1900s. Emile Bachelet proposed to magnetically levitate trains using attached alternating current (AC) loops above conducting metal sheets, such as aluminum, on the ground. Other ideas followed, based on conventional electromagnets and permanent magnets. However, all these proposals were impractical. Either power consumption was too great, or the suspension was unstable, or the weight that could be levitated was too small. The first practical Maglev system was proposed and published in 1966.1 It was based on Maglev vehicles carrying lightweight superconducting magnets that induced currents in a sequence of ordinary aluminum loops mounted along a guideway. 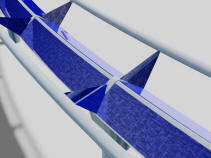 These induced currents interacted with the superconducting magnets on the vehicle, levitating it above the guideway. The levitated vehicle is inherently and passively stable against all external forces, including cross-winds, and the centrifugal forces on curves, whether horizontal or vertical. If a cross-wind tries to push the vehicle sideways, an opposing magnetic force is automatically generated that holds the vehicle on the guideway. If the vehicle is pushed down towards the guideway, the levitation force automatically increases, preventing contact. If an external force lifts the vehicle away from the guideway, the levitation force decreases, and the vehicle drops back towards its equilibrium suspension height. Recently, in many of his recent addresses, the American President George W. Bush has repeatedly emphasized the need for a unified and properly orchestrated domestic energy policy, with a focus on developing sustainable energy sources. He has also focused on the development of technology that can facilitate America to move away from its extraordinary dependency upon foreign and domestic fossil fuels and difficult to maintain Nuclear energy. We believe that the Interstate Traveler Project is one of those vital technology whose future is NOW. Unfortunately, a substantial number of our political leaders in the Senate and House have not taken his points seriously enough, nor done anything at all to move our Government, from Congress's perspective, in this very appropriate direction visualized by President Bush. While not ruling out oil, coal or Nuclear reactors, the President has made a very truthful plea for all sides of the politics of America to join together for the sake of our own Security, Economy and the Quality of our lives. It appears, however, that the Oil Industry, which leads the charge on most energy policy issues, has out of a combination of fear and greed- taken economic and political steps to sew shut the doors of change, in essence: blackmailing America with high prices at the pumps, high prices of automobiles, high prices for auto insurance, pharmaceuticals and derivative products, draining our economy to such an extent that Congress lives in fear that recommending any change will only cause the situation to worsen. Big Oil likely believes that such Political Change threatens the existing entrenchment of their oil selling. They fear it could impact the value of products from Opec and other oil producing nations (such as Alaska, Texas, California, Mexico, the Gulf, the Far East, the North Atlantic, Russia and Venezuela), as well as the major Oil Company distribution partners' (such as Chevron-Texaco, Conoco-Phillips, BP-Amoco and Exxon-Mobil) profits. Accordingly, trying to keep the world in a quandary for the next three decades, they are deliberately stirring up their workers who man the gas and oil pumps and the coal industry, the people in various national origins (the middle east, Russia and Venezuela for example) where oil is produced, and using the stirred pot to try and keep America too busy with the war on Terrorism, and Economic regrouping, to ever go about instituting this vital change in our direction. We at ACSA do not agree with the Oil Industry's VAST misperception about the consequences of such change, nor with the jurisdiction of the Oil Industry in this situation. We believe Big Oil does not possess the right to make such trouble as has been plaguing us for a century, in the never ending battle over fossil fuel reserves throughout the world. The toll in human collateral damage has been enormous, involving the deaths of millions of souls each decade. The production of oil and natural gas in our world is extremely environmentally impact-full, and has an eventual end where the pumps run dry, and the pipes fill with air and not natural gas. And then, it becomes INEVITABLE that other sources of energy will have to be adopted. Big Oil can live in denial all it wants, the end of the tunnel has NO LIGHT, it has only darkness: no more oil, coal OR natural gas, and that end is only decades away. While nuclear energy has promise, there is a limit to available fuel, and it is a dangerous form of energy that can also be used to produce Weapons of Mass Destruction, and has a devastating record on environmental safety, just looking at Chernobyl and Three Mile Island alone. There is absolutely no reason why clean Hydrogen Energy and Solar Energy can't coexist with Fossil and Fissile Fuels, now, to eventually light the end of the fossil fuel tunnel when it is reached. In fact, natural gas sources can be converted to power the Interstate Traveler, for so long as they remain available, as another source of energy during this transition period. Today, each energy source has its applicability, and eventually, as one source, fossil fuels, cease being abundant and decline, we will as a species have to be ready to immediately replace it with other sources. Instead of a massive "switch over" we can not only prolong the availability of fossil fuels, we can extend the range of our energy sources NOW at almost no expense, by implementing a project like the Interstate Traveler, with it's obvious benefits. Such will give us a chance to learn from experience how to intermix energy sources, and how to gradually replace declining sources such as fossil fuels without having to resort solely to Nuclear Energy and batteries, which energy sources in and off itself are a very mixed blessing. The Interstate Traveler is a remarkable step in the right direction, it's time is now, and it's purpose is ours: not to eliminate fossil fuels but to extend them, and to eventually replace them only where it is applicable. We are still going to need lots more development before we can meet the enormous demand of the world's businesses, government, transportation and homes. We, at ACSA, strongly agree with President Bush's assessments regarding America’s over dependency upon fossil fuels, particularly our over dependency upon that provided by foreign oil producers, which raises both an economic issue and a security issue for our country. We agree that this country needs a unified and properly organized energy policy. And we agree that clean burning hydrogen and solar energy represent two sustainable resources we must not overlook, in fact we must move on them immediately. Hydrogen is the most abundant element in the entire universe; it is even the basis of much of the energy found in hydrocarbons such as oil and coal. It’s time we used it, since it produces so few environmental byproducts, to power our transportation and, eventually, our economic system. 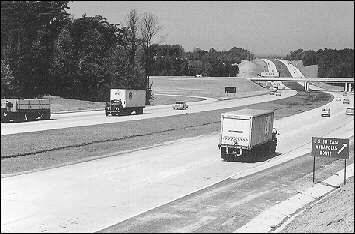 We believe the Interstate Traveler MUST be implemented throughout the USA, along with many other projects like it. And so, ACSA is engaging in ongoing research and investigation of all sides of the Bush Administration's Energy Policy Proposals, and is offering the HydrogenSuperHighway.com for sale. We have, for some time, been proposing to the Government and to the People the use of Solar and Hydrogen Energy, combined, to off load some of the energy demand within our country, demand which has vastly outgrown the available supply leading to higher prices, despite all efforts to the contrary. 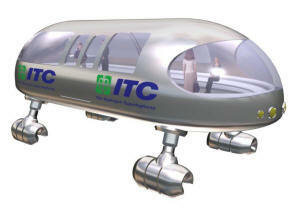 The American Computer Science Association encourages everyone who has the financial or other resources, to contact Mr. Justin Eric Sutton of the Interstate Traveler Project, and discuss his project: find out more about the remarkable possibilities of his MAGLEV plus Hydrogen from Solar Power transportation solution. We predict it won't be long before this project sees "the light of the Sun"; it is JUST THE ANSWER America is looking for right now, with even longer term implications than one might suspect! Written for the ACSA by DR. JACK A. SHULMAN.